After the successful ‘rising stars’ post in 2015, we decided to include another short ‘risings stars’ post this year. We will be excluding Lee Jae-Sung, Joo Min-Kyu, Suk Hyun-Jun, Hwang Hee-Chan and Kwon Chang-Hoon as they have already been mentioned and are currently at the peak of their careers. Check out the link to the 2015 post. 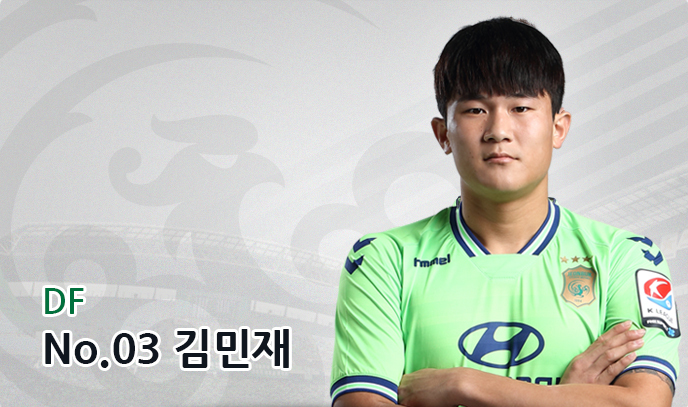 The 21-old year Jeonbuk Hyundai right-footed centre-back defender was one of the break-out stars of 2017. He was accoladed K-league’s young player of the year for 2017. Kim’s main attributes are his cutting technique, fast speed and ability to help with the build-up play. He is also renowned for his monstrous height of 190cm which has earnt him the nickname, the ‘Monster Rookie Defender’. For the 2017 season, Kim Min-Jae was featured in 29 games and scored two goals. Kim Min-Jae was one of the main contributors who helped Jeonbuk Hyundai win their fifth title this year. Notably, his stellar performance against Uzbekistan and the U-20 team (with Jeonbuk) attracted much attention from both national and international fans. With the recent call-up from Shin Tae-Yong, we expect to see him feature more frequently next year in the K-league and possible the 2018 World Cup. The 16-year-old Lee Kang-In first came into the spotlight for being part of a youth football reality show called ‘날아라 슛돌이’. Now, he has matured into an excellent figure and plays in Spain. Lee made our list as he accomplished a myriad of things year. For example, Lee recently made his professional debut for Valencia C.F’s B side at the age of 16. This is much faster than Son Heung-Min and Lee Seung-Woo. Lee will now feature more frequently in the Spanish third division. He is currently one of the hottest Korean youth players. He had a great year, where he was named COTIF Tournament 2017 MVP. He also participated in the 2018 AFC U-19 Championship qualifications where he scored two goals. 2018 will be a huge year for him both on international and club level. We will look forward to his appearances in the upcoming 2018 AFC U-19 Championships. Cho Hyun-Woo is a Kleague fan favourite and is known as the ‘Korean David de Ge’. Cho is one of the best goalkeepers in the league. He played in the Kleague Challenge last year, but his time was recently promoted this year to the Kleague Classic. He has had a marvellous year, so we decided to include him on our list. He was included in the league’s Best 11 in 2015 (Kleague Challenge), 2016 (Kleague Challenge) and 2017 (Kleague Classic). He featured in 35 of 38 games and kept 10 clean sheets. These are some amazing statistics and he was a vital player that helped keep his team in the first division. Cho also made a debut for the senior national team against Serbia where conceded one goal but made impressive saves all through the night. With his recent call-up from Shin Tae-Yong, we expect him to play a more proactive role at both club and international level. Possibly, he may soon establish himself as the starting goalkeeper of our national team. Lee Jin-Hyeon is a 20-year-old midfielder who plays in the Austria Bundesliga with Austria Wien. Sadly, he is relatively unknown and hasn’t really been a regular starter at his club. No one really knew about him until the 4 Nation’s Cup and the U-20 World Cup. He is known by the Korean media as ‘Shin Taeyong’s Cinderella’. Shin Tae-Yong discovered him while he played in the U-League with Sungkyunkwan University. Shin also helped Lee Jin-Hyeon develop as a player by changing his position from a Winger to a Central midfielder. Lee’s main traits are incisive passing, passing range, and ability to facilitate play. He is left-footed but like most Koreans, he can utilize both feet very comfortably. He is also a very versatile player meaning that he can play on either flank. Even though Korea’s performance at the U-20 World Cup wasn’t that impressive, Lee Jin-Hyeon made a positive name for himself. We look extremely forward to seeing him again soon. The 25-year-old midfielder and 2014 Asian Games gold medallist Yun Il-Lok had a great season this year. He scored five goals and provided twelve assists. Unfortunately, he just missed out on the ‘most assists’ spot to Pohang Steelers Son Jun-Ho. Yun is often deployed in the left-wing position and his main strengths are his exquisite dribbling skills and long passing. After a three-year hiatus from the national team, he recently got called up for the E-1 Championships. Although Yun was unable to feature in the tournament due to a cold, we are looking forward to his contributions to FC Seoul in the upcoming season. Perhaps, he may be given some more chances next year to feature in the national team. Son is still rising. Ended the year with a bang and starting 2018 with a bang. Currently in top form with the Spurs and is getting a lot of attention across the EPL. He’s currently performing like one of the top players in the world alongside his teammates.